I received an interesting voicemail the other day. It was from my brother-in-law, Terry, who was in a shop and saw how the proprietor had cleverly used an old rake head as a wine glass holder ~ how smart! Over the years, I've incorporated old rake heads into many different design scenarios ~ jewelry holders, art, etc. (I'll share more uses in future posts). But honestly ~ I've never thought of them as a wine holder ~ sheer genius! I've accumulated a collection of these rusted wonders over time. They had been discarded and long forgotten by their owners ~ I'm sure since the rake heads had broken off of their handles and they were no longer useful tools. When I happened across them, I scooped them up ~ with permission of course ~ knowing their future was bright. They've lived all over my home ~ inside and out. Such a humble, utilitarian object yet so much potential. I had to try this idea out for myself ~ here's what the rake looks like without its handle. I attached it to the wall using two wood screws ~ making sure to hit studs for added security. If you are unable to hit studs, I would use anchors so the holder is safely secured to the wall. To me, it far surpasses any wine holder I've seen in retail markets ~ and I think it gets an A+ for ingenuity and creativity. 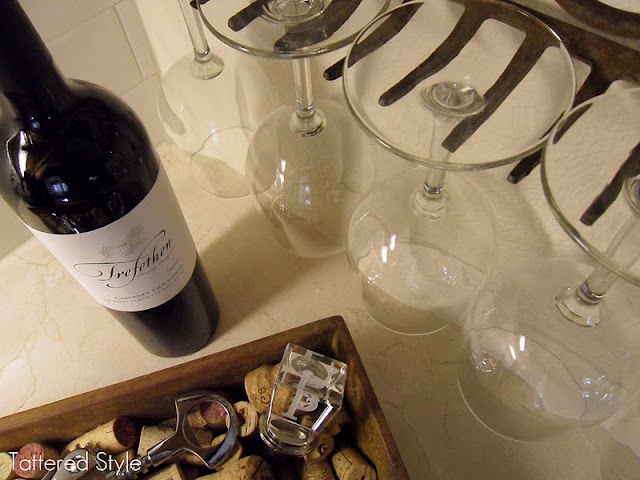 The exquisite crystal etched monogram wine stopper was a gift from a dear friend of ours ~ Sydney. It's quite lovely! I have a quirky affection for the unexpected, unusual and not so perfect. Kudos to my brother-in-law for spotting this creative idea. Maybe you have a clever idea for a rusty old rake head. I'd love to hear about it. P.S. Thanks for the Cab Kym! I met you at the Dallas Flea in the Spring. I love your idea for the rake. I use several rake heads myself in my closet for jewelry. One has served several purposes in its life. Originally a rake, I presume. The star of my mother's macrame in the 70's and now a jewelry holder in my closet. I'm using your idea in a post for the Etsy Fort Worth blog where I contribute (giving you credit of course). We are having a show in October and would love to send you more information. By the way, I love the new look on your blog! LOVE this idea :) Came across it on pinterest! We have a few old rakes like this from grandfathers who are no longer with us...a wonderful way to repurpose them! What did you do to the tip where the handle was attached? Hey Stephanie ~ So glad you like it! I loved hearing the story of your grandfathers rakes and I'm so happy you now have a way to use them. I added a photo of the tip of the rake so you could see how it looks. I just left it as it was ~ and love the look of it. Hope this helps ~ thanks for stopping by! That is a terrific idea I wish I would have found your blog a few months ago. I just spent a bunch of money on a wine glass holder that has half the character of yours. 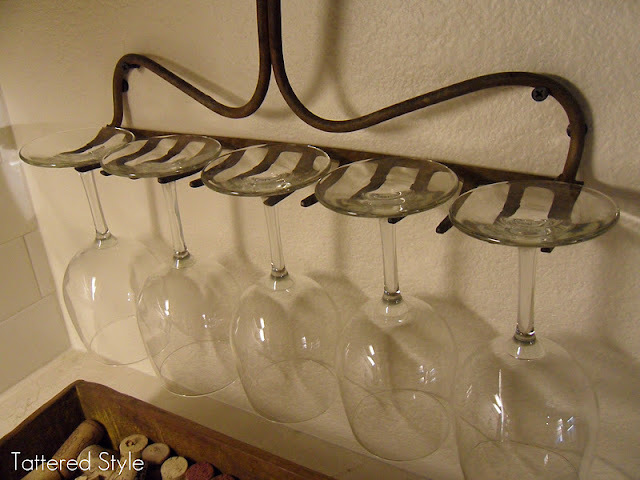 Love this idea and I now have my own rake wine glass holder :D I'm doing a post on my blog today and will link to you...thanks! Such a cool idea - I love that it works in a kitchen or on the patio! Thank you Kim ~ and thank you for the feature! 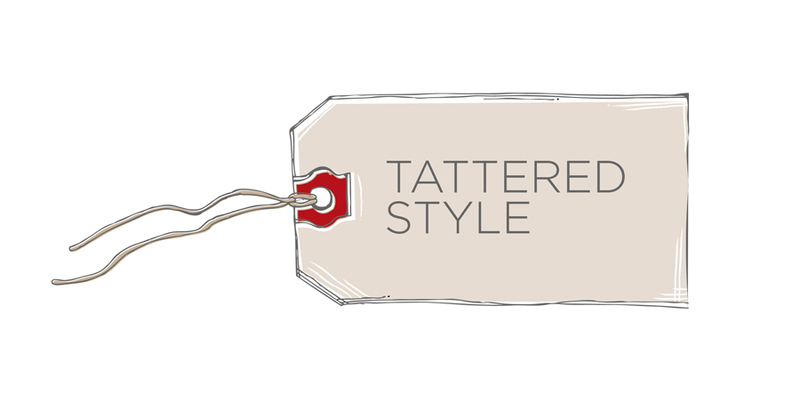 I do enjoy your upcycling blog. Thanks for sharing such great upcycling ideas! Not to my tastes, but a very interesting idea. One thing though, the wood screws you use to attach this to the wall seems to draw attention to the fact that it's a rake screwed to the wall. Also, I would be worried about the rake getting bumped off of the screws, and breaking all of the glasses. Perhaps using some molded plastic anchors like These instead would be a good idea? 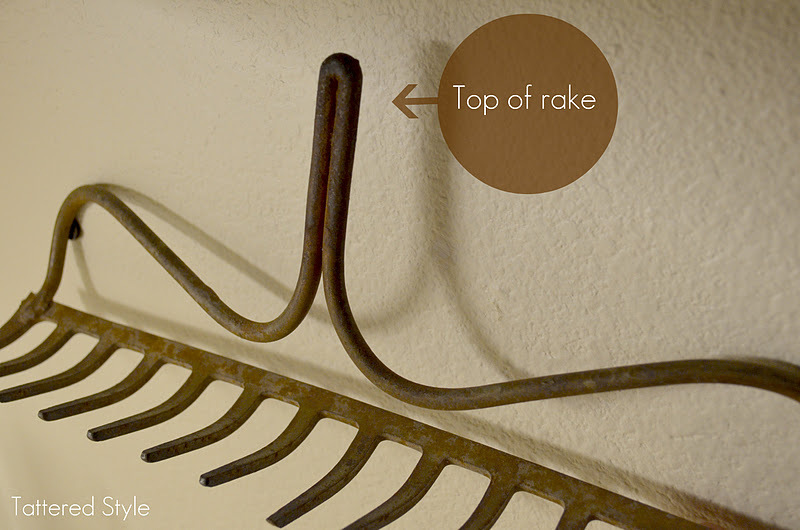 They would match the wall color and blend in, and the hook across the top would help secure the rake better. Wow ~ some really good thoughts and ideas. I do like the coax staples. I may just have to give them a try. They would definitely blend in better. So far we haven't had any mishaps with the rack coming off the wall ~ but this would sure keep it secure. Thanks so much for your comments and for stopping by. This is fantastic! Can't wait to go to my grandmother's house so I can make this (she's got a million of everything over a million years old!). Thanks! Glad you are feeling inspired. I hope you find a treasure trove of goodies! I have an old snow shovel I am going to hang on the wall and bend it up so I can use it as a shelf. What a clever idea ~ I would love to see photos!! Peach Hobbs: I love this! 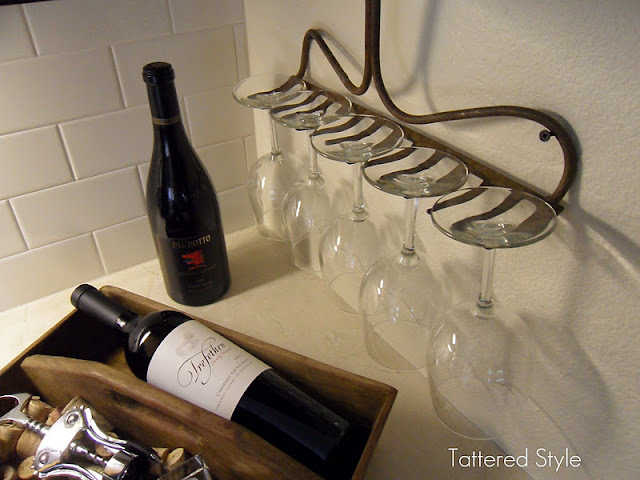 Went to my sister and swiped an old rake head off a decor she has, to surprise her with herown rake wine rack! Lol But Im going to paint the tips with vinyl, her wall is terra-cotta so I'm painting tips in a turquoise! Nice, very unique and resourceful. Everybody could do the same with old tools. Thank you Yves! I agree ~ there's probably lots more ideas of things you can do with old tools! So glad you stopped by and thanks for the comment! I love this...I pinned it and shared it on facebook! You can post and share it on my web site at www.ohmy-creative.com. 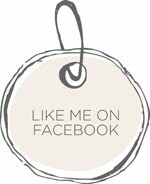 I would love to feature it! Thank you Susan. I've been on vacation with my family and have been a bit slow about responding to comments. I'm anxious to visit your website and am headed over right now. I'll also try to post ~ and will let you know if I have have difficulty doing so. Thanks for stopping by! I'm new to your blog. I saw this post through a pin that found its way to Facebook. I love the idea so much I featured it on my blog, also giving credit. I really wish I drank wine, or had a reason to have one of these in my kitchen. I saw a comment about using a rake head for necklaces. I may try that! Thanks for such a great post and inspiring me to dig through the shed. No telling what I'll find in there! Thanks so much for letting me know you featured my idea. My mother-in-law used wine glasses for water and juice ~ so maybe you could too. Then you could hang a rake in your kitchen. I've used a rake head as a jewelry organizer as well and it works out beautifully. Have fun digging in the shed and thanks so much for stopping by!!! i found me an old rake to do just as you showed. wow. looks so nice. one problem i have is....i feel the need to bend the tines up some to hold the glasses but how can i do this. they slide off as it is now. 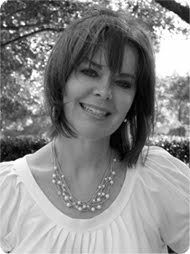 Hi Charlene ~ I'm so glad to hear you like the idea. The rake I have worked out just fine without altering the tines. I'm not sure how to bend ones that need bending ~ as the metal is so thick. I wish I could be more help to you. Maybe you will run across one where the tines are tilted a bit more. Thanks for stopping by and good luck to you! 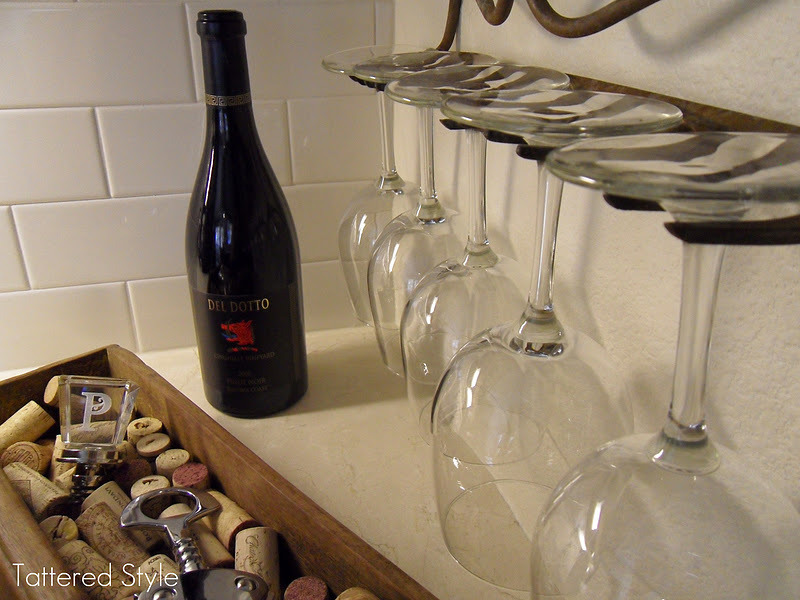 An oldie but goodie, wine racks made of wood are timeless, sophisticated and cost efficient. Wood wine racks offer many benefits such as their ability to be modular and stackable and thus grow with your wine collection. Did you have to do anything to the rake to prevent it scratching the wine glass stems? Great country decor idea. Love it! Very simple and decent wine rack loved it. Thanks so much! It has to be the easiest DIY ever. I'm glad you like it. Hi Noelani ~ I found the rake head with the handle already off. However, it would be easy to saw it off. Also, I would check to see if there is a screw holding the rake head on. Oftentimes this is the case. I hope this helps. Let me know how it turns out. Hi Noelani ~ Fortunately, I didn't have to remove the rake handle. It was already missing. However, you can always saw it off with a handsaw or jigsaw if you need to. Hope this helps. I wonder if the wine glasses will be okay. I'm concern if the glasses will get scratched other things can make the glasses look old.